Design of Transient Protection Systems: Including Supercapacitor Based Design Approaches for Surge Protectors is the only reference to consider surge protection for end-user equipment. 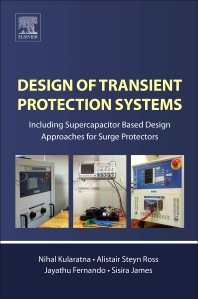 This book fills the gap between academia and industry, presenting new product development approaches, such as the supercapacitor assisted surge absorber (SCASA) technique. It discusses protecting gear for modern electronic systems and consumer electronics, while also addressing the chain of design, development, implementation, recent theory and practice of developing transient surge protection systems. In addition, it considers all relevant technical aspects of testing commercial surge protectors, advances in surge protection products, components, and the abilities of commercial supercapacitors. Nihal Kularatna is an electronics engineer with over 43 years of contribution to profession and research. He has authored eight books for practicing electronic engineers including the two consecutive IET Electrical Measurement Series books titled Modern electronic test & measuring instruments (1996) and Digital and analogue instrumentation- testing and measurement (2003/2008) and three Elsevier (USA) titles. His recent research monograph on energy storage systems, titled Energy storage devices for electronic systems: rechargeable batteries and supercapacitors, was also published by Elsevier in 2015. He was the winner of New Zealand Innovator of the Year 2013 Award and in 2015 he was conferred with a Doctor of Science degree by the University of Waikato. He is currently active in research in surge protection systems, high efficiency linear power supplies, power conditioning techniques and supercapacitor applications, with a contribution of over 150 papers to learned journals and international conferences. His work on supercapacitor assisted (SCA) circuit topologies/techniques such as SCALDO, SCASA and SCATMA culminated numerous granted or pending patents. He is presently employed as an Associate Professor in the School of Engineering, the University of Waikato, New Zealand. At international IEEE conferences and industry trade shows he frequently delivers invited tutorials, workshops and lectures on subjects he is passionate about, including the area of innovation and commercialization. His hobbies are gardening and car-grooming. His 100 research contributions include papers in satellite remote sensing physics, computational neurodynamics, general anesthesia, EEG signal processing, supercapacitor applications, surge suppression, and rechargeable battery modeling. With Moira Steyn-Ross, he edited the 2010 Springer volume "Modeling Phase Transitions in the Brain." He has been an active researcher for 30 years, with particular interest in the physics and mathematics of nonlinear threshold phenomena. He has served Arthur C Clarke Institute for Modern Technologies for 10 years in different capacities, and he is a contributor to several patents on supercapacitor assisted techniques such as supercapacitor assisted low dropout regulator (SCALDO) and supercapacitor assisted surge absorber (SCASA). He is currently a PhD student at University of Waikato, working on the implementation aspects of SCASA technique, which is currently licenced to an Australian power quality products company. Jayathu Fernando holds BSc and MSc degrees from University of Colombo, and University of Moratuwa, respectively. He holds BE, MSc and PhD degrees from Bangalore University, University of Aberdeen, and University of Waikato, respectively. His PhD thesis was on Surge Propagation studies under the supervision of the first two authors of this work, and his MSc thesis was on Computer Simulation of DC-DC Switching Converter Systems. He has developed mathematical models for nonlinear surge protection devices and employed MATLAB-based numerical simulations to predict the incipient failure of electronics in transient voltage suppressor systems (TVSSs). He has also validated the numerical simulations experimentally using a lightning surge simulator. Sisira James has served Sri Lanka Telecom PLC as a senior telecommunications professional for more than 11 years. BE, MSc and PhD degrees from Bangalore University, University of Aberdeen and University of Waikato respectively.